Over the past years a fad has crept up and has intensified dramatically recently. That is the fad of taking a perfectly fine pen and torturing it into achieving the unachievable: write with it as you would with a calligraphy dip pen. There are many videos and pictures of people with rudimentary writing skill in general, and virtually zero penmanship, torturing old Waterman, Eversharp, and Parker's to perform feats of calligraphy that those pens were never meant to achieve. 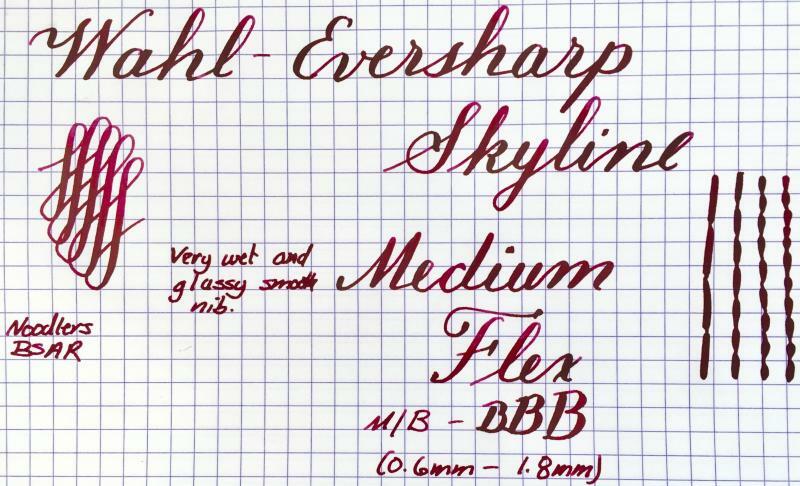 Some are clear manipulators eager to cash in on the flex nib fad on ebay. Others seem genuinely convinced that's the way to treat those pens.Here's a sample. Were others may see penmanship and flex nib, I see a tortured pen that no longer functions as it was intended. It is dumping massive amounts of ink on the page. That is likely the result of a combination of poor nib/feed installation and misuse of the nib, with detrimental effects on ink flow, nib seating, nib response, etc. Edited by pinkpelikan, 02 March 2018 - 19:58. There's many threads here centered on beating this horse to death, jolting it back to its feet for another go, then beating it to death one more time. "These pens aren't meant for this! Do that twice and it will snap!" "I've done it for 30 years!" "That's a fluke!" "Pens were flexier 50 years ago!" "No they weren't!" "Yes they were! What about model X!" "That was rare, you've got a model Z" "No, its a model Y"
etc, etc. The argument is endless. People can and will use their pens how they please. "People can and will use their pens how they please." True. I didn't find that dead horse thread you mention, so I thought I'd start my own. Those considering buying a "super, extra flexible" vintage pen, may use or not the information when shopping. Edited by pinkpelikan, 02 March 2018 - 20:56. Maybe once the market has been depleted of these relatively "cheap" vintage flex nibs, it may provoke the market to make more. However, seeing how many flagship Iphone x's were destroyed just for upvotes, you'd have to push the price into the $10K before the abuse would likely abate, if anything. Nice frankenpen. Appropriate use of calligraphy nib. Is that an everyday carry? Edited by pinkpelikan, 02 March 2018 - 22:23. Have you tried a Brause EF66 on it? Would it fit? EDIT... It won't fit in the cap on this Ranga. I normally have it in a Desiderata Icarus and the cap on it has plenty of room. 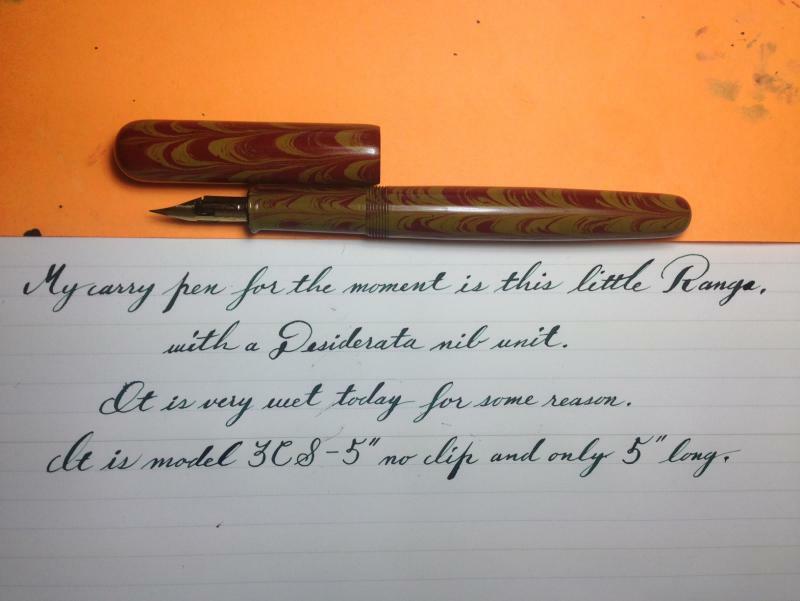 Nibs that fit the Desiderata are the Zebra-G, Brause Rose, Hunt 101 & Leonardt Principal EF. Nibs that won't work are any of the other G nibs like Leonardt & Nikko. Edited by Nail-Bender, 02 March 2018 - 23:37. That seems to be working fine. Not too wet either, unless you used blotting paper. Can you get ebonite feed blanks from Ranga makers? My heart sinks when I see pens getting destroyed but even worse is that no amount of pleading or reasoning will change the behaviour or attitude. So many sellers are prepared to tell bare faced lies for a quick buck and people end up trying to flex manifold nibs that would have otherwise made for beautiful writers. But what I will never for the life of me understand is why people will throw down hundreds and hundreds of dollars on a pen after freely admitting that they tried dip nibs and were unable to write with them. There seems a weird disconnect that they are unable to piece together that if they can't use a flexible nib in a dip pen then using a flex nib in a pen won't somehow magically change that. All nibs will flex once. A nib is always more flexible when you are selling it than when you are buying it. 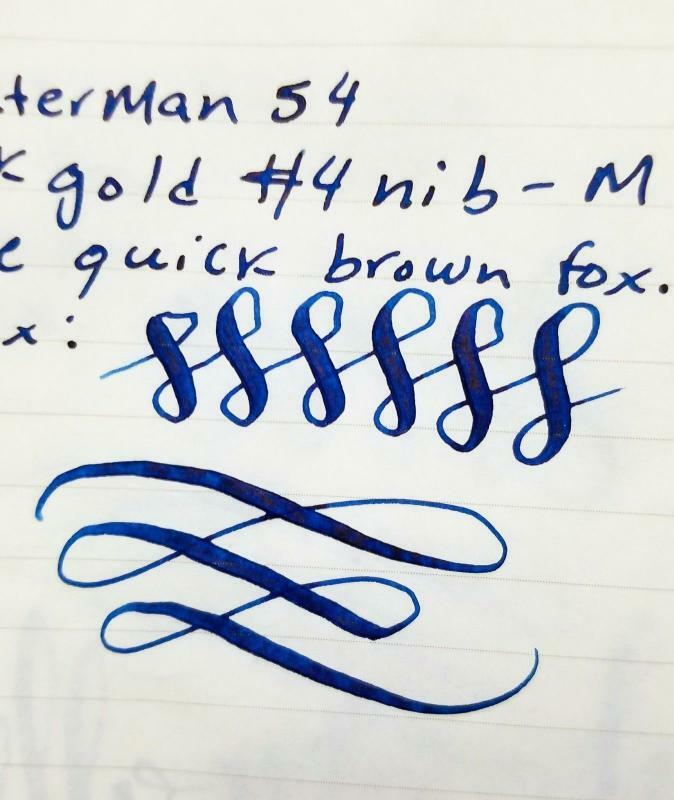 I've sort of given up trying to save vintage nibs and will gladly part with a Waterman Pink for 1500 in an unrestored 55. But what I will never for the life of me understand is why people will throw down hundreds and hundreds of dollars on a pen after freely admitting that they tried dip nibs and were unable to write with them. Fountain pen nibs fill a gap. If there were a fountain pen flex nib you could get cheap in 100-packs, the vintage pens would be spared. They sell two kinds of nibs for modern dip pens: I-dropped-my-pen-and-lost-three-toes sharp, and... barn-door. I use the most flexible nibs my purse will bear, but I don’t push them to their limits. That is an uncomfortable way of writing, anyway. I’m after a graceful, skater-like experience of writing which won’t wear out either my nib or my arm. If there were a fountain pen flex nib you could get cheap in 100-packs, the vintage pens would be spared. Farm Boy wants $1500.00 for his pink nib and that is cheap for a good one. That's 1890 nibs or about one per day for over 5 years. 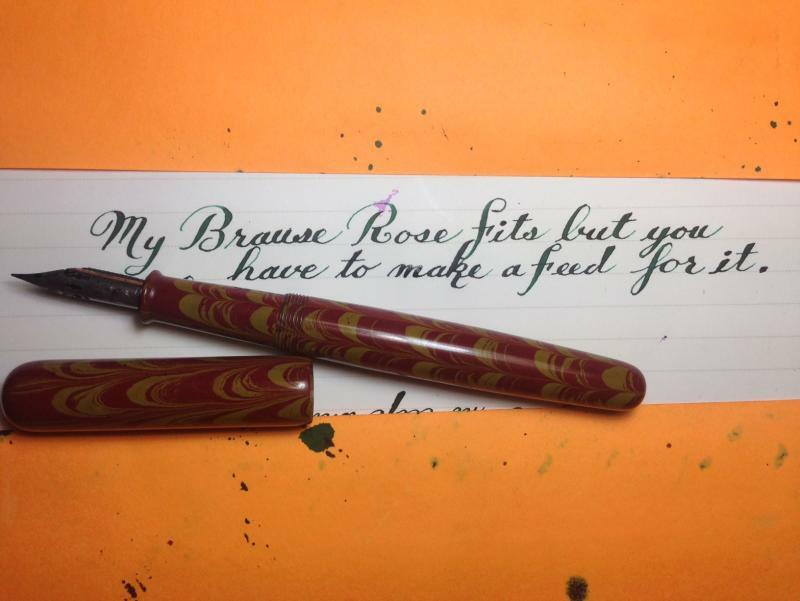 And a Leonardt-G kicks the ever-loving-snot out of any pink nib ever made. I look at people talking about gold nibs and all I see are collectors. Very very few in the least bit interested in actually using them. Edited by Nail-Bender, 03 March 2018 - 05:04. What pen would take a tachikawa g? No blotting paper but it will take you a couple of hours to make a proper feed with 150 grit sandpaper & nail files. Not easy but they work better than the Zebra-G because of the smaller "vent hole"
Ironically, Zebra-G nibs are the worst nibs to use in frankenpens but the most often ones seen in that capacity. Hours of work so be warned. Edited by Nail-Bender, 03 March 2018 - 05:19. I only have 3 of the 'G' nibs Zebra, Leonardt & Nikko. I have three or four wet noodles***....that I use for normal scribbling, in I do not practice. I keep swearing I'm going to practice. ***I have a Hunt 99-100&101, that make those wet noodles look uncooked. I've regular middle flexible dip pen nibs that flex more and as easy as a fountain pen wet noodle. Proper use of any of those nibs, requires a calligraphy book, and practice. There are some wonderful scripts in stiff italic nib writing, that may actually help before one gets too carried away with Spencerian. 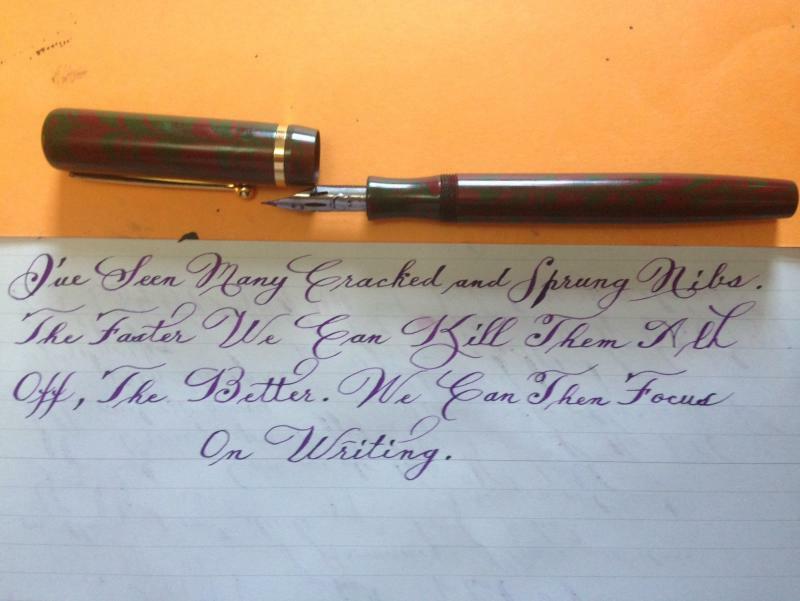 Those who can really write in Spenserian, are more worried about speed of snap back than how fat a nib can be pushed. Nail Bender seems happy with a dip pen nibbed fountain pen........as long as you have a supply of dip pen nibs it's a good way to go. My italic book was of great help....any time I take a hammer and chisel, break open the dust rust shut book. It teaches me how to draw a letter. The pen and nib is of course held different, before the big knuckle and canted, but for right handers it's still a push pull method. One sees how the letter is best drawn. Practice is the key.....and cheapest is dip pens. But in the era of instant gratification, patience is a foreign word. Edited by Bo Bo Olson, 03 March 2018 - 13:12. The faster we kill them the more the remaining pens are worth.